Want to know what to expect when you stay at Acorn Cabin Rentals? Check out our Gatlinburg and Pigeon Forge cabin reviews! We are proud to share honest feedback from previous guests. Our reviews are a fantastic resource for anyone trying to decide which cabin is right for their next getaway in the Smoky Mountains. Browse through the testimonials to learn what guests loved about our vacation rentals. If you have stayed with Acorn Cabin Rentals before, don’t forget to send us a testimonial to add to our Gatlinburg and Pigeon Forge cabin reviews! We stayed at the Simply Serene cabin outside Pigeon Forge. It was very cute and clean. The view off the balcony was great but the other cabins were close enough to hear the guests there. It wasn’t bad. When we arrived they called me to let me know they were coming out to fix the hot tub. Worked great the rest of the weekend. Perfect little fenced area for our dogs. The only thing to note is A) you need your own firewood and B) if you need to use the pull out couch you’ll need your own sheets for it. Overall this was a great vacation experience and I was very happy. We stayed in the "smoking view" it was absolutely beautiful view and a very nice cabin fully furnished with silverware ,plates, washer and dryer, dishwasher ,cable TV, ceiling fans, and even a charcoal grill outside. Two rooms both with there own bathrooms, dressers, TVs and a balcony with pool table. The porch has a hot tub on it with rocking chairs for the full southern feeling. I would have gave 5 stars all day but we had simple issues that we notified Aunt bugs about and 1 was fixed 3 days after being at the cabin . The hot tub needed chemicals and was dirty with debris in the tub. They resolved this after 2 complaints on the 3rd day. We were able to use it before we went home. The other issue was the air conditioning did not work. There were no screens in any of the windows so we could not leave the windows open. We notified them of this also. We were offered no apologies or simple solutions or discounts. We would have been satisfied with any of these . I would stay there again these were not deal breakers but just customer service issues. Family was so pleased with cabin It was beautiful. Absolutely gorgeous! Staff were very helpful. We have rented twice. Never a problem. Aunt bugs cabin rentals was a great choice for vacation. My wife and I enjoyed every minute of our time there. The awesome cabin, the jacuzzi tub and the hot tub were awesome! We will definitely be back!! The location of the cabin was in a great spot, very close to downtown but nestled up the mountain with privacy on the back deck and hot tub. It wasn’t as clean as it could have been, cobwebs everywhere and some mold was spotted in the bathroom. The grill outside was electric, so no propane or charcoal was needed. Also the fireplace was on a timer, so wood was not needed. We have the bare essentials in the kitchen, but enough to cook breakfast and grill some chicken and veggies. We had a great trip overall. This cabin was perfect for us!! It felt like we were away from everything. It was so relaxing and to be able to cook and not have to eat all our meals out was wonderful... Jason and the staff was so friendly and helpful. We will be staying with Aunt Bugs again!! This cabin (379) was a very cute and cozy cabin. The views are amazing, the hot tub was ready for us when we got there and had the perfect view. The gas grill was not working well, but that wasn't much of a big deal. The showers were nice, and the kitchen was well stocked with pots and pans. Everything else was great! Our cabin (Morning View 131) was very nice and clean. Everything worked properly too. The staff that checked us in was extremely nice as well. The view from the cabin was not as the pictures depicted, I'm guessing that they need to be updated. It was not as secluded, or easy to get to, especially in the fog, as we were led to believe. However, we had a wonderful time nonetheless. This was our first trip to Pigeon Forge and we want to thank you for helping make it a great experience. We stayed in A View To Remember 204, it's a beautiful cabin with amazing views! Really spacious and beautifully decorated! We actually got married out on the main deck of the cabin. The view of the mountain side with all the colorful trees were a perfect backdrop for our pictures! Very friendly staff! They helped us find a last minute beautiful cabin! The cabin was very clean and the view was breath taking! Only thing I recommend which has nothing to do with Aunt Bugs but maybe they can rely the message is making the street signs more user friendly up the mountain as we got lost a couple of times and ended up on a dead end road where we had to back up with nothing protecting you from each side of the road which could be dangerous as if you go off the cliff it’s a death trap. Also, more lights up the mountains. We stayed in the "Afternoon Delight" cabin for our honeymoon. It was amazing. Absolutely beautiful. All of the amenities plus. Hot tub and pool table were enjoyed immensely. It was everything and more that we had hoped. Will definitely stay there again when we come back. We absolutely loved our stay with this cabin agency. The reservation and check in/out process was so easy. The cabin itself exceeded our expectations. Very roomy and clean. Everything except one fold out couch was in perfect working order. Beautiful location. 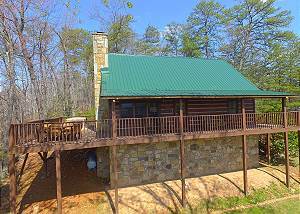 Very private with a nice view yet less than 5 minutes to Pigeon Forge. The driveway is very steep and narrow so I wouldn't recommend it without a 4 wheel drive in winter but don't let that stop you from renting this cabin any other time. It truly is amazing and we will definitely be back! Our Stay in Aunt Bug's "Almost Heaven Cabin" was THE BEST! We took our family and stayed for 10 days. From the moment we got there until we left, everything was perfect. The cabin was beautiful, clean, decorated so classy and had everything you needed as a home away from home. The Internet worked perfectly too! I also want to say the beds were so comfortable I didn't want to get up in the mornings! The hot tub was perfect for the kids as well and the game room in the loft . Honestly it was the best vacation for us all and we all enjoyed every moment being in this beautiful cabin. I certainly plan to come back again. We had a family reunion in Redneck Ritz and it was perfect. The location worked well for our family. We were about 10 minutes from downtown Gatlinburg, so it made it convenient. The views were incredible! It was nice having coffee in the mornings on the deck with the view greeting us. Our family enjoyed the game room and we had a few pool tournaments while we were there. We will be booking soon for next year! Amazing Stay! This was our first time with Aunt Bug's and we were very happy with our stay. The staff made our check-in a breeze. We went directly to the cabin and it made life so much easier with a 3 yr old. We stayed in Dare To Bear and it was perfect. It was peaceful and private. A much needed break and not long enough! Thank you for sharing your wonderful cabin! This was our first vacation rental of this type. I was totally impressed! The cabin was amazing. The people were fantastic and friendly! The only thing we had to do was exchange the propane tank the second day as it ran out. The views were breath taking. The cabin was even better than the pictures showed and was impeccably clean and equipped with everything we needed. We did bring paper plates, silverware and cups but the kitchen cabinets were completely stocked so we didn't need them at all. I will say the drive up the mountain road was an experience on it's own but exciting too. Just go slow and stay on your side. Lots of blind turns and curves. We were so impressed that on day our 3rd day we all said to each other we are coming back HERE next year. My 2 teenage daughters also loved the cabin and all the attractions around Pigeon Forge and Gatlinburg. Great job Aunt Bugs!!! My husband and I stayed in Apple Bear #116 this past week. It was absolutely perfect! Exactly what we wanted, nice hot tub off the back porch with a swing overlooking a beautiful view. Everything was nice and clean very well set up and stocked. Very close to Pigeon Forge and easy to find. We are looking forward to booking another cabin in the future! We loved our cabin. It was so comfortable and clean and beautiful. I slept so incredibly well every night. We didn’t spend anywhere near as much time at the cabin while visiting Gatlinburg as I thought we would. I think I’d really enjoy staying here at Christmas time, and we would be in the cabin more often. We stayed at the Apple Bear View, it was a perfect cabin for the two of us. We were celebrating our 8 year Anniversary. The King size bed, was actually very comfortable. It was one of the most comfortable beds that we have slept on in a cabin. The view was really nice as well, and I love how they supply a fly swatter and bug spray for outside. Since you are partly in the woods as well. Also, another major plus, the hot water lasted a long time. Even when filling up the huge Jacuzzi tub, it was still hot after taking so long to fill it up. The housekeepers could do a little bit of a better job when it comes to dusting but overall it was the perfect cabin. *Hint* Coffee drinkers out there, the cabin is on well water, so if you don't mind that taste then you will be fine with the coffee maker, otherwise you might want to buy individual coffee drinks that you can open and drink and not have to use the well water. If we can ever get away again for just the two of us, we will be staying in this cabin again. The cabin was a lot more than we honestly expected. Beautiful kitchen, super clean The staff from the moment we showed up in town to get keys and paper work at their office was fast and very accommodating. Beautiful cabin conveniently located to pretty much everything in town. very quiet and secluded enough. We will most definitely be coming back. My wife and I stayed a week in A View to Remember. Spectacular views, peaceful, and fairly secluded. No problems with anything from check-in to checkout. Only complaint is that I wish they would let you check in earlier. Check in is at 4pm and paying $150/night with checkout st 10am seems a little ridiculous. But other than that definitely recommend! Me and my wife just stayed there 5/5/2018 through 5/7/2018. Our cabin was called river sounds, exactly as described very clean when we got there and the staff were super friendly at check in. If you're looking for a secluded gateway I would definitely recommend this cabin. The only thing I didn't like was having to leave. Our stay was awesome the cabin was as shown in the pictures.....it was nice having our hot tub and a fire place....they called the day after we checked in and even replace the back por6light for us with no problems....we will be renting from aunt bugs when we come visit again from Texas.....the cabin was very clean and enjoyable! Thank you aunt bugs for a great experience!